I haven't posted in a while, been mostly idle the last month or two, but I thought I'd sum up some additional thoughts on Green Brick Partners now that the deal has closed, 9/30 proforma results came out, and the company hosted its first conference call as a home builder. The headline Q3 results were down across the board, but with a relatively small home builder, I think it's safe to expect lumpy earnings results quarter to quarter. With maybe only 25% of the shares outstanding in the float, Green Brick is essentially a private company and can be managed in a way that puts the long term results ahead of meeting estimates and smooth out earnings. 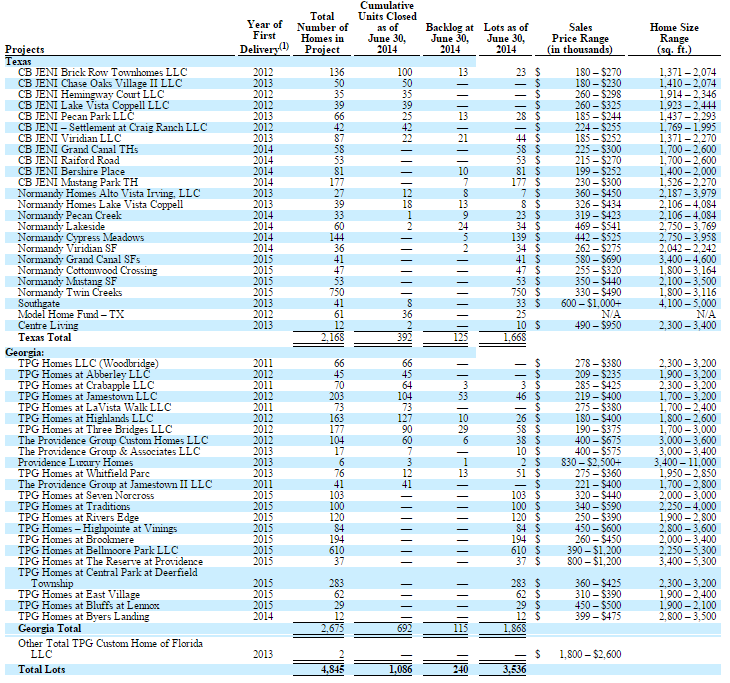 I was a little surprised to see as part of the deal closing that Green Brick took down the entire $150MM expensive term loan from Greenlight, but that gives the company approximately $40MM in cash to grow the business, especially in its two large communities coming online in 2015. 25% of the company's assets are in the Twin Creeks and Bellmoore Park communities that come online in 2015 and have a 6-8 year build out runway. Additionally, there are several mid-sized communities debuting in Atlanta next year that add up to a little more than another Bellmoore Park. In total, 75% of their lot inventory is in communities that will start delivering in 2015, making the initial 50% revenue jump buried in the company's management projections seems more plausible. But with that said, the current stock price looks a bit stretched, based on the proforma numbers, Green Brick has a book value of about $156MM with a full allowance for the deferred tax assets, so at $8.85 its trading for 1.7x book, a little rich. Or if you assume a 15x earnings multiple, the market is baking in $0.59 per share, which is a little higher than my adjusted earnings estimate I made in September that included cost cuts, term loan refinancing, etc., so the market is likely a little ahead of itself there as well. I'm an avid golfer, but I find the line about getting bored playing golf as an early retiree great, just the kind of person that I want to be invested alongside. You also get the strong sense that he created JBGL/Green Brick very opportunistically, the financial crisis lead to such dis-allocations in the real estate market that he couldn't help himself but to jump back in and restart his career. Says even more that a message board poster built a strong enough relationship with a highly respected hedge fund manager to seed him with millions of dollars to start JBGL/Green Brick. Pretty fascinating story. So that's probably it on Green Brick for a while, it's up 50% over the last couple weeks and is no longer obviously cheap, but with such a small float, I wouldn't be surprised to see it become a good value again, keep it on your watchlist. I'm going to just hold my position for now as I don't like booking short term taxable gains this late in the year, but wouldn't fault people for selling some here. I like the long term setup and could see Green Brick being acquired by a larger builder in a few years once the NOLs are used up and Brickman wants to retire again.